Carole Nataf is an Allaprima Oil Painting Artist, recently based in London. She was born in Paris in 1989 where she lived for more than 20 years. She grew up in the heart of the Latin Quarter in Paris, influenced by the intellectual and academic vibrancy of the city. There, she discovered French impressionist painting and the impressionist focus on light and color. In the summer of 2008, she joined Parsons School of Design in NYC to follow the Summer Illustration program. She studied Literature and Philosophy at the university of La Sorbonne where she grew a strong interest in Philosophy of Art and Aesthetic Theory. 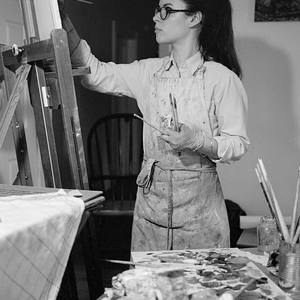 While studying Art privately in Paris, NYC, San Francisco and Boston, she was naturally drawn to Plein Air painting and wet-on-wet oil painting techniques. Her figurative portraits, landscapes and still life paintings are inspired by the traditional impressionist process consisting of painting outdoors and from life, immersed at the heart of her subjects. Her paintings explore the power and delicacy of reflexive light: reflections at the surface of the water, on glass, metal and gold, in eyes, on skin or hair. Her work features the representation of contrasting textures by associating soft and harsh elements, delicate and blunt brushstrokes : textiles, metal, glass, paper and skin often meet on her canvas. 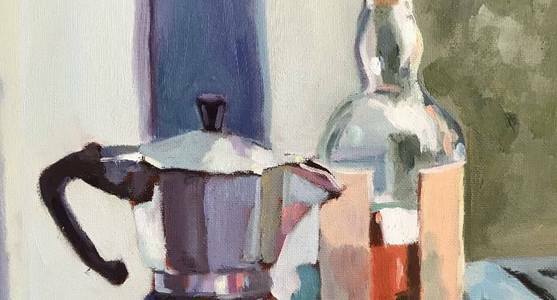 ​ Influenced by artists such as Edward Hopper and Edouard Manet, she is admirative of their unmatched ability to simplify shapes, and juxtapose contrasting values without blending. Currently she lives and works in London, where her studio is located. She won the First prize at the Massachusetts Revere Beach Art Festival in 2016 and was represented in New-England Galleries such as The Golden Thread Gallery, CT, the National Art League, NY and Kingston Gallery in Boston, Strada Exhibition in Paris France, as well as dozens of private collections.